Welcome to the future, where your iPhone merges with your wallet…. kind of. 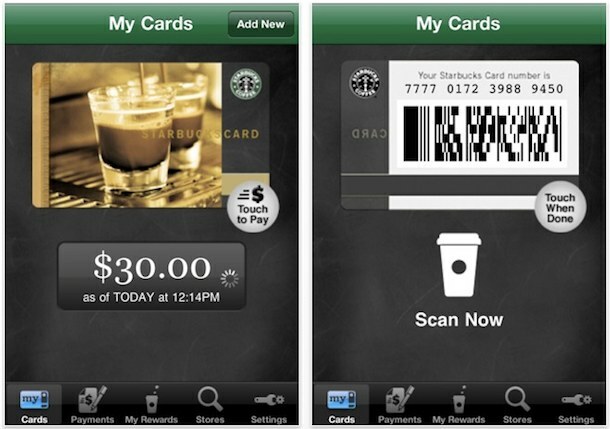 You can now buy anything at Starbucks with your iPhone (or iPod touch), thanks to the Starbucks Card Mobile app. The app works by linking to a Starbucks gift card account, and when the app is launched it displays a barcode that can be scanned by the barista, making for a quick transaction. Starbucks Card Mobile not only lets you pay directly from the app, but you can also check your account balance, view transaction history, reload your account with a credit card or paypal, track your rewards, and even locate nearby store locations. Whatever you feel about Starbucks, you have to admit this is a great idea. Starbucks Card Mobile is a free download via the iTunes App Store available here and works on the iPhone and iPod touch. At this time, only US based cards and stores are supported, but this is expected to change soon. I’ve used this fairly often and anytime someone gives me a Starbucks gift card I add it to my iPhone so I don’t have to carry it around, it works incredibly well – all you do is open the app with your logged in Starbucks card account and they scan the screen, it’s easily as fast as using a credit or debit card, and less cumbersome than cash since you don’t have to worry about change. I’m safe. There is no Starbucks where I live. Great app though. I hope this catches on and more businesses make apps for this, better yet I hope banks jump on so I can use my iPhone as a credit card.